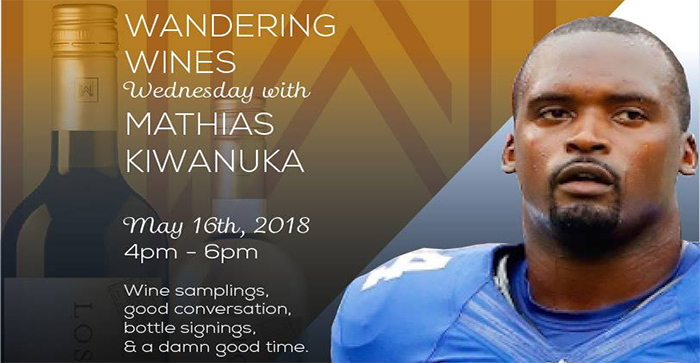 Join us on Wednesday, May 16th at 4pm while we hang out with Mathias Kiwanuka, former NY Giants defense end and co-founder of Wandering Wines. We’ll be chatting about wine, beer, football and everything in between, while they sample some of their finest selections. Wandering Wines will also be donating a portion of bottles to the brewery, in which the proceeds will go directly to Kids in Distress (KID); a licensed nationally accredited agency out of Broward and Palm Beach Counties working for the prevention of child abuse, preservation of the family, and the treatment of abused and neglected children. So grab yourself a bottle to support a good cause, and don’t miss out on this once-in-a-lifetime opportunity!